Summary: The Economic and Trade Association of Tourism Industry approved and approved China Transport Yuangu Travel Co., Ltd. The Economic and Trade Association of Tourism Industry approved and approved China Transport Yuangu Travel Co., Ltd., which is officially included as a standing director of the Jining Tourism Industry Association. In the future, our company will jointly promote the healthy and sustainable development of the tourism industry in Jining through the association and the city's tourism enterprises. 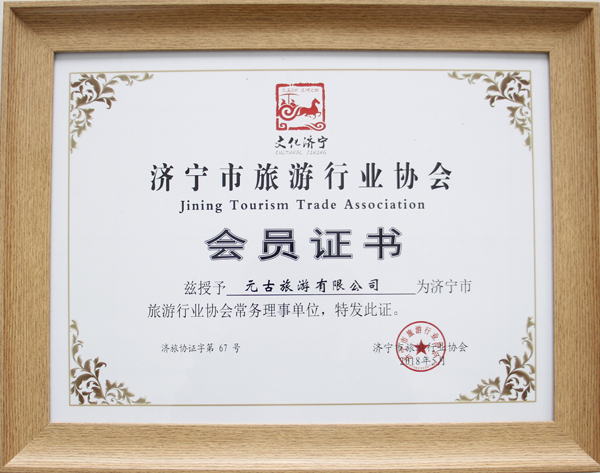 The Jining Tourism Industry Association was established in 2006 and successively established a number of working committees such as scenic spots, travel agencies, star hotels, tour guides, tourism commodities, and rural tourism. Over the years, the City Tourism Industry Association has actively assumed social responsibility and guided the transformation of tourism enterprises. The concept of management and service has fully mobilized the members and efforts to nurture a new hot spot for tourism consumption. It has fully revitalized the tourism market and has made outstanding contributions to accelerating the construction of a strong cultural and tourism market in Jining. Since the establishment of the company, it has actively committed itself to software development in the tourism industry. Its self-developed and operated one-way travel industry platform (www.1youw.com) project makes full use of Internet thinking to optimize the entire industry value chain in “Smart Travel” and regulates The tourism market has realized the paperless office industry for tourism. It has made tourism products reach terminal consumption in a convenient and real-time manner. This has helped the city's tourism industry integrate resources, reduce costs, improve operational efficiency and service quality, and enable participating parties to achieve resource sharing and market sharing. Winning has made positive contributions to promoting the optimization and upgrading of the city's tourism products and services! The Propaganda Tourism Company was elected as the executive director of the Jining Tourism Industry Association. It is the city's tourism industry's full recognition and great encouragement for the development of the company in the tourism and cultural industry, and it will also be a new opportunity for the rapid development of our company. . In the next step, we must redouble our efforts and actively fulfill the duties of the standing governing units. Through the platform of the Jining Tourism Industry Association, we must unite with the city’s tourism enterprises to jointly promote the transformation and upgrading of the city’s tourism industry, and use actual actions to contribute to the development of the national tourism cultural industry. More power!